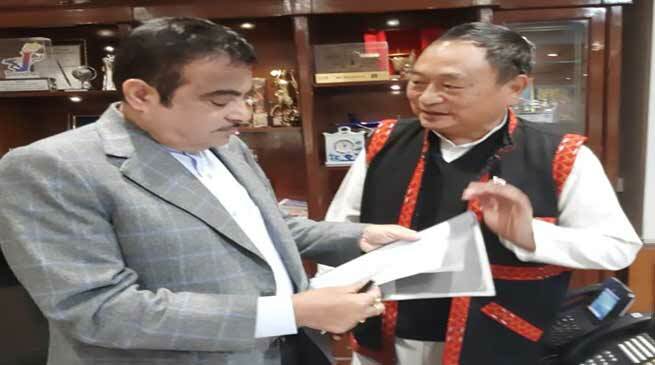 Following the 7th February LS session discussion during the Question Hour, the Lok Sabha Member Ninong Ering met Union Road, Transport & Highways Minister Nitin Gadkari today afternoon at New Delhi and discussed the issue of construction of the road from Pasighat (in East Siang district) to Dari (West Siang), via Koyu (Lower Siang) so that the much needed road gets the approval soon. On his part, Union Road, Transport & Highways Minister Nitin Gadkari him assured that the road would be constructed. To reach state’s capital Itanagar from middle and eastern Arunachal, one has to travel via Assam. But repeated and series of bandh calls by one or other organizations of Assam at various places affect the people of Arunachal too for simple travelling with the state of Arunachal Pradesh. The construction of this road will ease the repeated road blocked problems via Assam due to bandhs and strikes.